Today is Tuesday which means that normally students would have been sitting in the class rooms of Udayana University and studying Indonesian language and history. But once again this is no normal Tuesday - instead today is one of the numerous holidays of Bali. This thime there's the national holiday of Islamic New Year although that doesn't seem to affect too much the life in Bali. That's easy to explain by the fact that only 5 per cent of the population in Bali are Islamic and over 90 per cent believe in Hinduism. As I've already mentioned Bali is the only place in Indonesia where Hinduism is the majority religion. 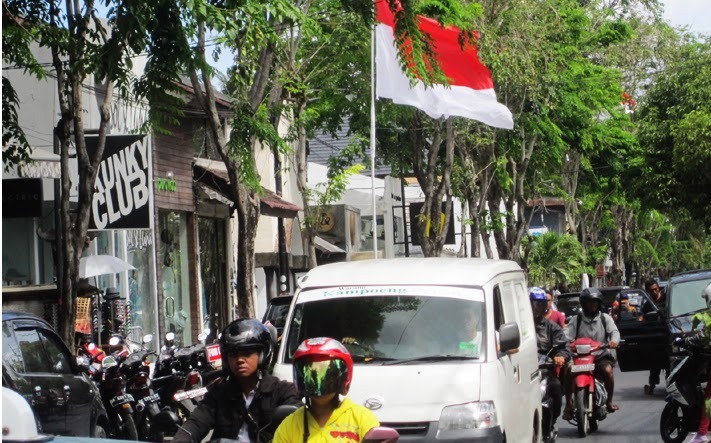 Overall in Indonesia over 80 per cent of the population are Islamic and that's why Bali also respects all the national holidays of Indonesia. During last few weeks there has been so many different holidays and ceremonies that I decided to write a blog post about all of the holidays that are part of the Balinese calendar. That includes all Indonesian national holidays (mostly Islamic mut also some Christian and even Buddhist holidays) and also some special Balinese hinduism holidays. That's why Bali is called the island of many holidays. - New Year's Day: I'm pretty sure that almos the whole world acknowledges the change of the year in the western calendar even though the country (or the area) would have its own calendar as Bali and Islamic world do. So yeah, New Year's Day is a puclic holiday also in Bali and Indonesia. - Maulid Nabi Muhammad:This day is the celebration of the birth of Prophet Muhammad so it resembles the Christian Christmas. In Bali Maulid Nabi isn't that significant holiday (same way as all other Islamic holidays) because Islamic people are clearly in the minority in Bali. Overall in Indonesia Maulid Nabi is one ot the biggest holidays. - Chinese New Year: Also in Indonesia and in Bali the Chinese New Year is an official holiday because there's significant Chinese minority living in Indonesia. Chinese New Year is a great and gorgeous celebration but unfortunately it isn't celebrated that widely in Bali because there's very few Chinese people living permanently in the paradise island. Still, in some of the temples there may be some happenings. - Nyepi: Nyepi is one of the biggest holidays in Bali and because of that it's also part of the official national holidays respected in the whole country of Indonesia. Still the influence of Nyemi is clearly the most visible in Bali amongst the Balinese Hindu people. Nyepi is the 'Day of Silence' when everyone in Bali stay home silently and meditating. During Nyepi all stores, public places and even the airport are closed down. From 6 AM until 6 AM next morning no one (execpt the official traditional security man) is allowed to leave their home and walk around the streets. This tradidion is followed by also the tourists and the visitors. In your home you aren't allowed to light any lights, have loud noices or have any kind of celebration. After Nyepi comes the new year in Balinese calendar that is celebrated widely. In 2014 Nyepi will take place in 31st March. - Good Friday and Ascension Day of Jesus Christ: Although over 80 percent of Indonesian people are Islamic, even over 10 per cent of the population are Christian. That's why all the main Christian holidays are also part of the official holidays in Indonesia and even in Bali although only 1 per cent of Balinese are Christians. So yeah, Bali truly is the island of many holidays. - Waisak: As I already mentioned above, Islamic, Christian and Balinese Hindu holidays aren't even enough because there's also one Buddhist holiday in the Indonesian calendar. It's true that only 1 per cent of the Indonesian population believe in Buddhism but that 1 per cent means more than 2 million people. So yeah, it's easy to understand why the Waisak, celebration day of birth, enlightment and death of Gautama Buddha (all in same time) is also an official holiday in Indonesia. In Bali it's pretty unnoticeable but in other parts of Indonesia there's huge groups of monks celebrating the Waisak. - Ascension Day of Prophet Muhammad: As the name already propbably tells you, the main reason for this holiday is pretty much the same as the one for Jesus Christ in Christian calendar. And as I've already told you, the Islamic holidays aren't that significant in Bali although in other parts of Indonesia they are. - Ramadan and Idul Fitri: Indonesia makes no exeption for celebrating Ramadan. The ninth month of Islamic calendar is Ramadan, Muslims worldwide observe this as a month of fasting. Of course the whole month of Ramadan isn't an official holiday but Idul Fitri (the end of Ramadan) is. - Indepence Day: Indonesia got its independence from the Netherlands in 1949 and that great thing is celebrated every year in 17th August. This is of course really big holiday all over Indonesia. - Idul Adha: I think I already mentioned Idul Adha in this blog as it was celebrated in Indonesia approximately one month ago. As most of the Indonesian holidays it is connected to Islamic religion: it is celebrated because the Prophet Ibrahim was ready to sacrifice his own son. I can tell by my own experience that Idul Adha is quite unvisible holiday in Bali. - Islamic New Year: This is celebrated today and I can't say that it would've affected my everyday life here in Bali any way. Still, it's part of the official holiday calendar here and in other parts of Indonesia it is of course really important moment. - Christmas Day: Same way as Eastern of course the biggest moment of the Christian year, the Christmas is also part of Indonesian holidays. I think it will be interesting to see how much the Christimas is really promoted in Bali because only 1 per cent of Balinese people are Christian but on the other hand Christmas is nowadays very global phenomenom. At least until now I haven't seen any Christmas buzz in Bali which is (in my opinion) a great thing. Let's see. - Saraswati: Saraswati is the Balinese Hindy holiday to celebrate the day when knowledge is given by gods. The day is celebrated by traditional Hindu rituals, which include traditional dancing and singing holy songs. The day is named after the beautiful goddess Saraswati. I can't say anything concrete about celebrating Saraswati in Bali because I haven't had chance to see that in person. 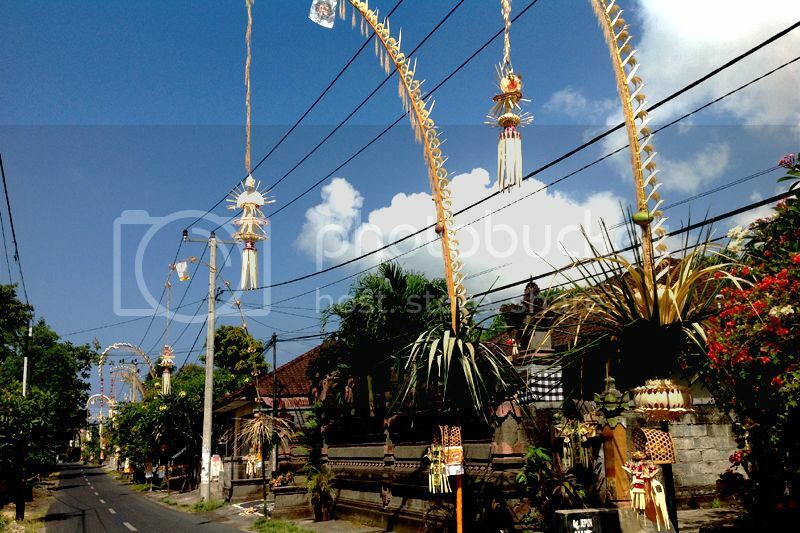 - Pagarwesi: Pagarwesi is one of the main holidays amongst the Balinese Hindu people. Balinese people believe that giving really special gifts to god can save them from evil and unluckiness. - Tawur Agung Kesanga: The day before Nyepi (look above). The big ceremonies are held, people wear traditional costumes, everyone's playing music and so on. This is the 'The Day of Great Sacrifices'. - Ngembak Geni: The day after Nyepi. After the period of 24 hours of silence has ended, familys and friend reunite and spend the day together. - Galungan and Kuningan: Galungan and Kuningan are clearly one of the biggest holidays in Bali. There are big ceremonies and huge decorations (look the picture above) can be found everywhere. Galungan and Kuningan are one of those few times during the year when it's much more difficult to find an open store or restaurant (even though it's not impossible at all). Balinese people believe that Galungan is the day when the spirits of deceased people return to their homes. 10 days later comes Kuningan when the spirits return to the heaven.